BMI staged another installment of its 12th & Porter series on Thursday, July 30, featuring legendary singer/songwriter Bobby Bare. He charmed with mid-song recitations and quirky stories. 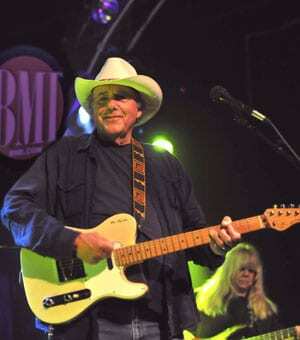 Joining Bare on the bill were Charlie Pate and Dixie’s Finest, including songwriters Dale Dodson and Ronnie Bowman; as well as family trio the Henningsens. The free show co-hosted by the venue and BMI drew a hodgepodge of Music Row executives, Americana aficionados and classic country fans. Kellie Pickler joined the Extreme Makeover: Home Edition crew recently to surprise the Terpenning family and tell them that their home had been chosen to receive a makeover. She will perform at the family’s final and emotional reveal. The episode is set to air on ABC in the fall. BNA Records is planning to release her new single, “Didn’t You Know How Much I Loved You” to radio later this month. It first appeared on Small Town Girl and was re-recorded for her latest album. Currently, Pickler’s busy with a tour schedule that includes her own shows plus the Fearless Tour with Taylor Swift, and she can be found on the August cover of Nashville Lifestyles. MCA Records is releasing Mallary Hope’s three-song digital EP entitled Love Lives On today (8/4). It will be available at iTunes and all other digital partners. Mallary is a co-writer on all three tracks – “Love Lives On,” “Times Like These” and “Wildflowers.” The 22-year-old singer/songwriter from Georgia wrote the single/title track with Matthew West and Shane Stevens.